On 6th March 1942, Commander Carlo Fecia di Cossato of the Italian submarine (R.Smg.) Enrico Tazzoli, acting in coordination with overall U-Boat command in France in a joint venture called Betacom, opened its Caribbean account by sinking the Astrea, a Dutch steamer of 1,406 GRT, 610 miles East of San Salvador. Di Cossato would go on to be one of the Aces of the region, accounting for six ships – tied with Reinhardt ‘Teddy’ Suhren in U-564 and bested only by Bauer in U-126. 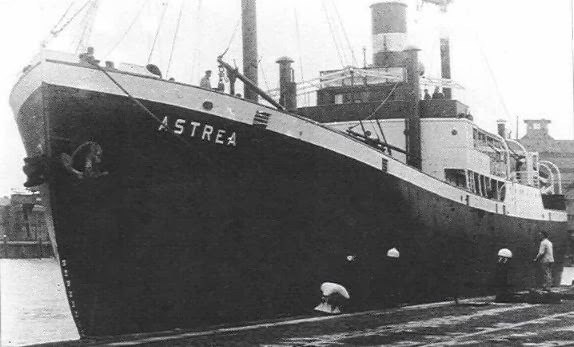 Astrea was a Dutch cargo ship built in 1921 by the Lobitsche Scheepsbouw Mij, in Lobith, Netherlands. She was owned by the KNSM, or Koininlkijke nederlandsche Stoomboot Maatschappij of Amsterdam. With a GRT of 1,406 tons she had a 900-horse power triple-expansion engine which could develop 10.5 knots. She was 83.82 meters overall, 11.94 meters wide and 4.52 meters deep (wrecksite.eu). In March of 1942 she was en route from Para (?) to New York via Trinidad with a general cargo. She had a total complement of just 27 persons; nine of them were Dutch and the other eighteen were Antillians from Curacao possibly of Dutch descent. Tazzoli and his crew sank the Astrea by shell gunfire alone, without expending torpedoes. Her position varies considerably from the Dutch to the Italian. The Italians reported 28.05N by 63.30W whereas the Dutch position given was 29.12N by 46.29W, or much further East and north. Most likely the Dutch reported their last full daily position and did not factor in the distance travelled to the spot at which they were sunk. Either way the position is several hundred miles North-northeast of Anegada, between there and Bermuda. Following the sinking all 27 members of the Astrea’s crew were rescued by the Dutch (KNSM) merchant ship Hebe and the Argentinian ship Rio Iguazu, ten days after their ship was lost – on the 16th of March. (Source: William Oldenburg, Forum “Sinking of Dutch OSCILLA by Italian Submarine”, Jan. 12, 2007). According to John Mozolak the Rio Iguazu was an Argentinian motor ship of 3,177 tons, formerly known as the Bretagne before 1942 and owned in Denmark. She was built in 1928. The Hebe was built in 1916 and at 1,140 tons was only 250 feet long. Operated by KNSM on a line from Curacao and Haiti to New York in the 1920s, she was lost in a collision later in the same year – 1942. In fact the collision occurred on 11 April off Cape Hatteras with HMT (trawler) St. Cathan, and both ships were lost, with all Hebe crew being rescued by a US Navy vessel and put ashore in Charleston South Carolina. Sadly 30 of the 39 crew of the trawler were lost on duty. Since Hebe was on a convoy voyage from New York to Curacao less than a month after rescuing the Astrea survivors, it is unlikely that any Astrea crew were still on board her, however it points to New York being that port where the survivors were landed as there was insufficient time for her to have mae other ports. It is unknown where the Rio Iguazu deposited her Astrea survivors (Sources: wrecksite.eu, Mercantilemarine.org post “Two Dutch Ships Called Hebe” 31 Aug. 2010).